What is “We Don’t Know Either”? 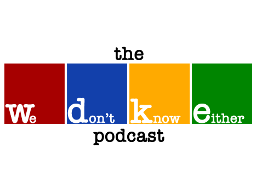 “We Don’t Know Either” is a podcast of pure mild amusement. The guys and gals that write the questions for Bridgetown Trivia have always had pretty stupid conversations about what is going on in the world. It’s how we come to a consensus on how the question will be worded and what topics will be going into trivia each week. We decided to record these conversations for your entertainment. Congratulations! You are now a fly on the wall at the Bridgetown Trivia office. You get to look over our shoulders and peek at the answer sheets days before you have to show up at the bar. We are also kinda funny, so we’ve got that going for us too. Remember… we may write the questions, but We Don’t Know Either.